Thanks to a NAN bursary, we (a group of AiM artists, plus AiM coordinator Richard Turner, AiM trustee John Holt and AiM mentor Kathy Griffin) were able to visit like-minded organisation CORE ARTS in London. We now better understand the history of Core Arts, and how it works with local residents in Hackney, supporting their mental well being through the arts, using music, writing and the visual, digitial and plastic arts. Core Arts members are able to engage in creative pursuits over an extended period, with a timetable offering more than a dozen different creative activities over the week. We have a better grasp of how the organisation also raises income to support its work through a professional design bureau, which undertakes contracts for outside bodies; and a horticulture project, providing gardening services in the locality. At an organisational level, we have seen firsthand a different model of working to support individuals with acute and enduring mental ill health, some elements of which we may consider incorporating into our own approach. The diversity of income streams Core Arts has developed, through establishing complimentary commercial operations (Core Design, Core Horticulture), offer a route to underpin sustainability. Core Arts has recently negotiated the purchase of the building from which they deliver their services. This is also an aspiration of AiM, to provide a more permanent home from which to operate and grow. We loved the Core Arts garden, it provides a little oasis of green and tranquillity amidst the hustle and bustle that is London. We hope that we could include something similar in our future plans for AiM. On an individual level, the visit highlighted the great strength of AiM’s studio base, being able to provide an individual dedicated studio space to up to 20 AiM artists (compared to the smaller “group studio” space at Core Arts). We felt that AiM’s individual supported studio spaces, with 24/7 access, enable our participants to engage with and develop their art practise to a very high level. AiM is grateful for the NAN bursary, which provided us the opportunity to visit a like-minded group in London, something we might otherwise not have been able to afford. There is no substitute for visiting fellow artists in their own creative spaces in order to gain a better understanding of their work. Core Arts is a well established and diverse organisation. Offering courses of classes to Artists and Musicians who experience severe and enduring mental health issues. I felt that it was more like a design college or day centre with a curriculum that people could choose and apply for a class that interested them. AiM does provide a curriculum of workshops which are open to the public. 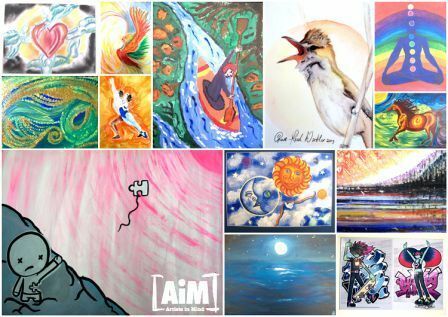 Beyond that, AiM provides a sanctuary and creative community where people are free to experience in a non judgemental environment with others who suffer from mental ill health. Core Arts was quite different to AiM, even though their ethos is similar. They are able to cater for a wider range of interests. It was good to talk to some of the Core Arts members, and see their work. An impromptu sing-along in their lovely garden was a great way to end the visit. Our visit to Core Arts was very enlightening. The contrast between the two organisations was quite apparent. As a result I feel lucky that AiM is managed the way it is. The approach that we receive at AiM is far more holistic, giving it the feel of being a second home, rather than an institution.